Like many people on this planet, we’ve seen images of the Statue of Liberty thousands of times, in books as a child and then in popular culture as an adult. 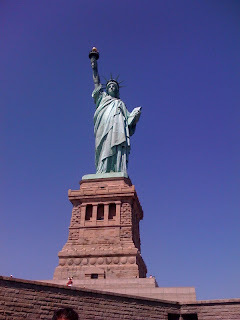 I wonder if anyone has ever counted how many times the image of the Statue of Liberty has been used in movies. Just last night we were watching Ghosbusters II (the one where the Mayor of New York says “Being miserable and treating other people like dirt is every New Yorker’s God-given right”), and there’s the Statue of Liberty (with Bill Murray and Dan Akroyd in her crown) as they take the Statue which symbolizes all that is pure and good to the Museum to stop the evil forces/evil pink goo and rescue Sigourney Weaver. So we’ve seen the Statue through fun movies like these. 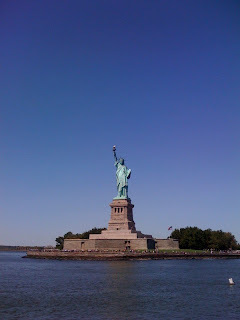 But on August 26th, we finally got to see the Statue in real life. It was an amazing experience and we definitely accomplished one of our “must do before we leave earth” things. We highly recommend purchasing your tickets online,printing them and planning ahead. The date you want to go, most likely won’t be available, so purchase it at least weeks in advance, especially when you visit it during the popular tourist months like we did, in the summer. Purchasing it online prevents you from standing in one of the longest lines we have ever seen. But you still have to stand in another line – to get on to the ferry. The line was long but it moved pretty quickly. The security screening to get on the ferry to take you to Liberty Island felt more intense (although quicker) than an airport screening. 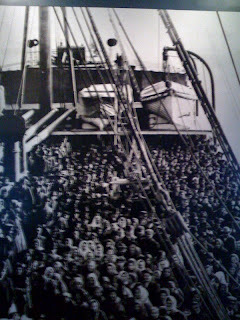 Leaving the island to Ellis Island or to Manhattan was a much longer and less organized wait than getting to Liberty Island. There’s no way to describe the line than it’s downright awful. 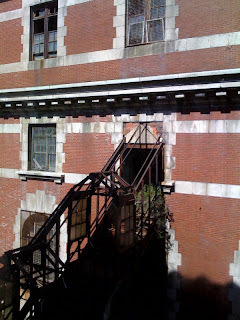 Some people choose to bypass the Ellis Island Museum since they think seeing the Statue of Liberty is enough. We highly recommend you go to the museum and take some time there. 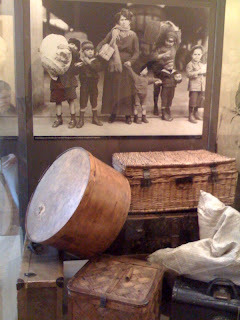 The building that is the Ellis Island Museum was completely renovated to resemble what the building and rooms actually looked like for the immigrants. 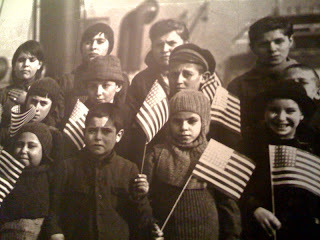 The museum contains a lot of significant photos, artifacts, and the stories of immigrants. There’s a series of rooms (including where they slept and ate) that re-create the step-by-step process for these immigrants (from medical examinations to mental health tests). Some of the artifacts include the original clothes, luggage, household items, bibles and rosaries, brought over to America by the immigrants. You can also find out if your family records are at Ellis Island at their AFIHC records center – the records cover immigration through Ellis Isalnd and New York Harbor between 1892 and 1924. Driven by hardships at home and by the promise of economic opportunity, over twelve million immigrants landed on Ellis Island. Despite the emotional pain of leaving their family and home, they hoped their lives in America would somehow be better. Here’s the Registry Room, which was reconstructed to look as it did for the immigrants. Nearly every day, for over two decades (1900-24), the Registry Room was filled with new arrivals of immigrants waiting to be inspected and registered by immigration service officers. Over 5,000 people would file through this space daily. 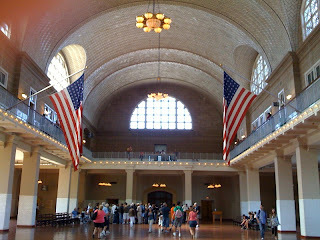 For most immigrants, this hall epitomized Ellis Island. Here, they encountered complex demands of the immigration laws and an American bureaucracy that could either grant or withhold permission to land in the U.S., hence the term Isle of Hope/Isle of Tears. This sculpture titled “The Sphere” which was conceived as a symbol of world peace stood in the plaza of the World Trade Centers for decades. It was damaged on September 11, 2001, but endures now as a symbol of hope and placed at Battery Park as a temporary memorial for those who lost their lives in the terrorist attacks at the World Trade Center. The eternal flame was ignited on Sept 11, 2002 in honor of those who lose their lves. You can see this sphere on your way to stand in line for the ferry.